This Open Source Enigma Replica product is exactly like our kit, but we have taken the time to solder, assemble, program & test it ourselves. It includes everything that comes in a kit (listed below), but all components are already in place & tested. It provides software only plugboard functionality. No plugboard included. This is the best option for those that want the immediate use of our Open Source Enigma Replica but don't want to assemble it & are willing to build their own box. 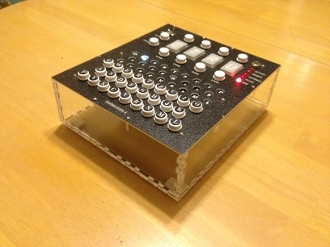 Essentially, it is like our boxed Enigma without the wood box & the hardware that goes with the box. It comes in a Laser cut Acrylic box while quantities last.